Current evidence indicates obesity and other metabolic disorders such as type 2 diabetes and insulin resistance are influenced by host genetics and lifestyle. This cascade of ever growing diseases is also associated with low-grade inflammation, as indicated by an overabundance of biomarkers in serum. What initiates or triggers the inflammation associated with these metabolic disorders? Multiple studies in humans and mice have demonstrated that a high fat diet can trigger inflammation (see references below). But a high fat diet alone is not the whole story. If it were, a lot of Paleo dieters would be in trouble. It seems what might be missing from that high fat diet and the gut bugs deep in the gut hold the answer to what triggers the inflammation. Every person on earth has two genomes. Our human genome, which is a mash up and shuffled deck of DNA from mom and dad, is the one we are familiar with and, for better or worse, stuck with. Our second genome is more dynamic and made up of trillions of bacteria we initially receive during birth from mom and continuously throughout life from the people we hang with, to the foods we eat, and the places we live. Numbering in the thousands of species, our microbial friends (and foe) outnumber our human cells 10 to 1. In other words, humans are 90% microbe and only 10% human. Humbling. Forthcoming book by the folks at Human Food Project. Click Here if you would like to receive a notice when this book becomes available. Spawned by the success and technical achievements of the Human Genome Project, an explosion in our understanding of the role of the microbiome (all the genes of our gut microbiota) in human health has literally flipped modern medicine and the understanding of what makes us sick on its head. Importantly, even though dynamic interactions with our microbiome is conditioned by influences as varied as birthing method (vaginal vs c-section), life time exposure to antibiotics, and general lifestyle choices, diet appears to be driving the species diversity of our microbiota and the much-needed functions they encode. Given the dynamic relationship that is emerging between diet and the composition of our microbiome, researchers have observed that adult germ-free mice had 40% less body fat their germ-bearing (conventionalized) littermates consuming the same diet. Astonishingly, when germ-free mice are colonized with the gut microbiota from genetically obese mice (ob/ob), the otherwise lean mice dramatically increase body weight. 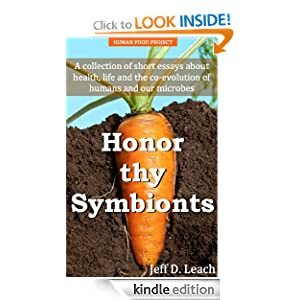 In short, gut bugs salvage energy from otherwise non-digestible polysaccharides – think dietary fiber – through special enzymes they encode and our genome does not, which in turn increases circulating glucose and insulin levels and thus weight. These and countless other experiments in mouse and human models have firmly established the role of the microbiome in energy homeostasis. However, the most interesting finding to come of this ongoing research is the fact that germ-free mice do not gain weight when fed either a high fat or regular chow of the same caloric content. This is counter to experiments that reveal that a high fat diet promotes obesity in mice possessing a full suite of gut bacteria. Said differently, a high fat (lipids) diet alone cannot explain obesity in mice and that obesity and associated inflammation only occur in the presence of gut bacteria. So what is it about the presence or absence of bacteria that promotes weight gain in a high fat meal/diet? Multiple studies have shown that a high fat diet produces low-grade inflammation, which in turn promotes metabolic disease such as diabetes. Interestingly, the low-grade inflammation correlates with circulating levels of a plasma endotoxin known as lipopolysaccharide (LPS). LPS is the primary structural component of the outer membrane of Gram-negative bacteria. Importantly, LPS only originate in the gut. Researchers also note that under conditions of a moderate or high fat meal/diet, serum levels of LPS go up, but levels of the bacteria Bifidobacterium species in the gut go down. The sum of these studies, and there are a number of them (see references below), reveal that meals of 33%, 38% and 100% fat are sufficient to raise levels of LPS and create the conditions for what is now referred to as metabolic endotoxemia – leading to metabolic syndrome. So lets review. A high fat diet results in elevated levels of serum LPS, a condition referred to as endotoxemia. The presence of elevated levels of LPS in the blood triggers several inflammatory markers that are a precursor to the progression towards metabolic syndrome (e.g., obesity, diabetes). As circulating LPS goes up, levels of Bifidobacterium go down and germ-free mice eating either a high fat or normal chow diet weigh more or less the same (and do not have circulating LPS as the absence of bacteria – remember they are germ-free – means no LPS). But how do the LPS translocate, or leak, from the gut into serum? And why during a high fat diet and not high caloric diets as revealed by other studies? Seems the key to the gut permeability is tied to the abundance of the Bifidobacterium mentioned above. In a series of fascinating studies, researchers in Brussels fed a high fat diet to mice (and subsequently humans) to induce elevated levels of LPS. Elevated levels of serum LPS resulted in significant inflammation, weight gain, insulin resistance, and ultimately type-2 diabetes in the mice experiments. To test the hypothesis that serum levels of LPS are linked to levels of Bifidobacterium in the gut, a prebiotic oligofructose (from chicory roots) that is known to stimulate the growth of Bifidobacterium was added to a high fat diet fed to one group of mice, but not to the same high fat diet fed to another group. These set of experiments, which were also confirmed by other researchers, suggest that gut microbiota regulate endotoxemia and inflammation and mediate complications associated with metabolic syndrome. In other words, a moderate to high fat diet that does not include nutrients that will stimulate the growth of members of the genus Bifidobacterium concurrently will result in inflammation and complications associated with metabolic syndrome as LPS leaks into the blood. It is well established that byproducts associated with the fermentation of the prebiotics by Bifidobacterium, such as short-chain fatty acids (butyrate, propionate and lactate) positively effect gut barrier (reduce leaking) and improve tight junctions between gut epithelial cells. Therefore, by stimulating the growth of species of Bifidobacterium you may lower endotoxemia and improve or avoid any metabolic disturbances. Further improvement in barrier function has recently been linked crosstalk between the gut microbiota and the endocannabinoid system (a group of neuromodulatory lipids and their receptors). Therefore, if you are following a high fat Paleo Diet, you might do well to include additional sources of known prebiotic foods in your diet. On a daily basis, most of us consume very small amounts of prebiotics (1-4g) – mainly from foods like onion, leek, garlic, and dandelion greens (prebiotics are the non digestible oligofructose, inulin, galactooligosaccharides within these plants). If in fact the levels of Bifidobacterium in our microbiota mediate gut permeability to the extent discussed above, then our chronic low intake of prebiotic dietary fibers may be a significant player in our epidemic of metabolic syndrome. Our ancestors without a doubt consumed prebiotic-bearing plants. Over 36,000 species of the world’s flora contain the carbohydrate fructan (prebiotics), many of which are subsurface tubers, which would have played an increasingly important role in early Homo diet. In a paper I published in the British Journal of Nutrition, a colleague and I noted that archaeological evidence from dry cave deposits in the northern Chihuahuan Desert reveal inulin-type fructans from the desert succulents agave and stool were a primary carbohydrate for at least 10,000 years. Evidence from ancient cooking features, stable carbon isotope analysis of human skeletons, and well-preserved coprolites and macrobotanical remains reveal an average daily intake of 135 g of prebiotic inulin for an average adult male. It is interesting to think that all of the attention that has been given to various substances that might lead to a leaky gut might be missing the 800 pound gorilla in the room – Bifidobacterium. Think I will have onion and garlic with my dinner tonight – how about you? Bäckhed F, Ding H, Wang T, Hooper LV, Koh GY, Nagy A, et al. The gut microbiota as an environmental factor that regulates fat storage. Proc Natl Acad Sci USA 2004; 101:15718-23; PMID:15505215; http:// dx.doi.org/10.1073/pnas.0407076101. Cani, P. D., J. Amar, et al. (2007). “Metabolic Endotoxemia Initiates Obesity and Insulin Resistance.” Diabetes 56(7): 1761-1772. Cani, P. D., R. Bibiloni, et al. (2008). “Changes in Gut Microbiota Control Metabolic Endotoxemia-Induced Inflammation in High-Fat Diet–Induced Obesity and Diabetes in Mice.” Diabetes 57(6): 1470-1481. Cani, P. D. (2012). “Crosstalk between the gut microbiota and the endocannabinoid system: impact on the gut barrier function and the adipose tissue.” Clinical Microbiology and Infection 18: 50-53. Deopurkar, R., H. Ghanim, et al. (2010). “Differential Effects of Cream, Glucose, and Orange Juice on Inflammation, Endotoxin, and the Expression of Toll-Like Receptor-4 and Suppressor of Cytokine Signaling-3.” Diabetes Care 33(5): 991-997. Eckel RH, Grundy SM, Zimmet PZ. The meta- bolic syndrome. Lancet 2005; 365:1415-28; PMID:15836891; http://dx.doi.org/10.1016/S0140- 6736(05)66378-7. Everard A, Lazarevic V, Derrien M, Girard M, Muccioli GG, Neyrinck AM, et al. Responses of gut micro- biota and glucose and lipid metabolism to prebiotics in genetic obese and diet-induced leptin-resistant mice. Diabetes 2011; 60:2775-86; PMID:21933985; http:// dx.doi.org/10.2337/db11-0227. Ghanim, H., C. L. Sia, et al. (2010). “Orange juice neutralizes the proinflammatory effect of a high-fat, high-carbohydrate meal and prevents endotoxin increase and Toll-like receptor expression.” The American Journal of Clinical Nutrition 91(4): 940-949. Laugerette, F., C. Vors, et al. (2011). “Complex links between dietary lipids, endogenous endotoxins and metabolic inflammation.” Biochimie 93(1): 39-45. Laugerette, F., C. Vors, et al. (2011). “Emulsified lipids increase endotoxemia: possible role in early postprandial low-grade inflammation.” The Journal of nutritional biochemistry 22(1): 53-59. Leach, J. D. (2007). “Prebiotics in Ancient Diets.” Food Science and Technology Bulletin 4(1): 1-8. Turnbaugh PJ, Ley RE, Hamady M, et al. (2007) The Human Microbiome Project. Nature 449, 804 – 810. Van Loo J, Coussement P, De Leenheer L, et al. (2005) On the presence of inulin and oligofructose as natural ingredients in the Western diet. Crit Rev Food Sci Nutr 35, 525–552. Vijay-Kumar M, Aitken JD, Carvalho FA, Cullender TC, Mwangi S, Srinivasan S, et al. Metabolic syn- drome and altered gut microbiota in mice lacking Toll-like receptor 5. Science 2010; 328:228-31; PMID:20203013; http://dx.doi.org/10.1126/sci- ence.1179721. Next Post Do spider monkeys hold the key to why we get fat? Fascinating post! I’m wondering if you might know what 135 g might be roughly equivalent to in terms of food for people today (everyday foods we can all eat regularly)…like, a certain number of servings of onions & garlic? Are the prebiotics mainly found in the alliums now or in lots of vegetables? Does eating yogurt with bifidum cultures also help to optimize gut flora? Also look for the word inulin. 135g is a lot and almost impossible to get in prebiotic inulin alone – with today’s plants. But just increasing the diversity of plants you eat will benefit the bacteria – specifically the lactic acid bacteria. But I would highly recommend eating more onions if you can – that’s an easy prebiotic, and goes well with a lot of things. I would say i eat one to two onions a day myself, from breakfast to dinner. Also, note that cooking breaks the inulin down (ie, the carmelizing) – so not too much cooking. Google inulin and prebiotic plants – you will get a big list. I know dandelion greens have inulin. And, like HFP below commented, don’t cook them too much. I wash and trim dandelion greens, then pulverize them raw in the blender with some water until smooth. Then, I gulp it down. For hours afterward, I feel like my blood is buzzing with a low hum in my ears. 🙂 You should be able to get these at the supermarket. Some can be bitter. Go for the more tender, lighter coloured leaves. Another thing that has inulin is chicory root. I’ve not been able to find them in the grocery. Do you know endive? Well, I understand that chicory is the root of the endive leaves. The supermarket either trims them away before they display the endive, or the farm does. Home brewery stores have dried chicory root for brewing. I don’t know if it’s good for eating though. It might be bitter, but one day I intend to try some. What type of fat was in the rodent’s “high fat” diet? Was it high omega 6 seed oils, hydrogenated oils, animal fats (lard=40% monounsaturated), or tropical (much higher saturated) fats? What are the macronutrient percentages? How much fat was considered high fat? Any of these factors could have been important in causing the results observed. Why is it never mentioned when the results are reported? I had this same question. Quality of fat is key on a high-fat diet. One of the studies listed in the References section mentions effects of a high-fat/high-carb meal on inflammation. That’s what Paleo-style dieters are trying to avoid — combining the two! I want to read some of the studies, but at first glance, it looks like a lot of the ones listed above don’t really apply to the Paleo strategy. Yeah but you can’t argue from rodents when it comes to high-fat diets. A high-fat diet in rodents is the equivalent of a refined carb diet in humans. And have you ever looked at the actual fats used in these studies? I have never seen dripping or coconut used – except in the Nanji-French alcohol studies (that showed benefits from saturated fats). Usually it’s vegetable oil of some kind, and/or trans fats. The studies purporting to show inflammation in rodents do not use a natural high-fat diet but instead use a prepared emulsion, probably from soybeans. In addition, most rodent studies claiming to use a high-fat diet still contain a high amount of sugar. For rats, 40% fat is considered high-fat, while in humans, it’s usually over 70%, with all carbs contributing less than 10%. Thanks for creating the American Gut project. I’m excited for it! Thanks Jen. It’s difficult to imagine how incorporating a few foods that contain prebiotics (e.g., inulin) would hurt. Approx 36,000 plants contain inulin (beta 2–1 fructans). However, most are 1) either not available in your local grocery store or 2) appear in low quantities (like in bananas). Incorporating more onions and garlic in your diet would give you the most bang for your buck. However, extensive cooking (caramelizing will reduce the inulin). Good luck and thanks for following along – American Gut project should be interesting. A little confused here. When you say germ free mice do you mean the mice don’t have any gut bacteria? It seems you’re saying that having no bacteria is preferential for not being obese. Do you think anything can be done to the obese mice to make them less obese by de-germing them? I’m not clear if you’re saying bifidobateria are germs and therefore if they are missing from the germ free mice it is beneficial. Thanks Jorge. The germ-free mice means they are essentially starting with a clean slate. And when you seed with a bacterial population, they go about their job of extracting calories. In other words, the bacteria play a role in energy harvesting. In the case of bifidobacteria, the produce byproducts that seem to improve gut barrier function. Reduce their numbers, the gut leaks which results in inflammation. So by inference here it seems that the issues around high fat diets are that we end up configuring our bacteria to be able to eat these substances and even thrive, with the result that our body can now process them and we gain weight. However, it seems that you can have a gut biome that can ignore fats as well if they are treated in moderation, for us. If this is so this has interesting implications on the Paleo diets outlined above as well as other speciality diet groups like the Inuit and Central asian horse nomads. I’m glad I had onion and garlic soup for dinner last night. What if you have serious trouble digesting raw onions and garlic? Is that somehow related to the inulin’s effects on the bacteria in your gut? How do you get around it? Can you take pure inulin supplements instead? One glaring omission here is any discussion of the source of fat. It is widely documented that fats high in Omega-6 (vegetable, corn, seed oils, etc.) contribute to inflammation. Omega-3 fats (grass-fed butter, salmon, etc. ), however, do not seem to have these same effects. It is critical to differentiate between these fat sources if we are going to attempt to draw any conclusions with regard to the healthfulness of high-fat diets. This is especially important due to the fact that most modern high-fat human diets consist of processed rancid seed, corn, soybean, and vegetable oils. the more interesting thing – i think – is the reduced permeability once bifidobacterium are restored. ie, the fat amount and type is not so much the issue as its the reduction in substrates that also reduce certain lactic acid bacteria. So.. what about the whole fodmaps issue? Here is an article on what horses go through, some having problems with fructans from grass, and of course, grains. Genetic mutations can prevent them from burning those carbohydrates properly. Tying up in horses has been suggested as similar to Fibromyalgia in humans. As a sufferer of Fibro, I must keep my carbs very low, and my fat high, moderate protein to keep my pain level down. Hi- are they referring to any kinds of fats? I’ve been ale to access a couple of the references and, for example, the article by Deopurkar (2010) just refers to saturated fat in the form of cream. What sort of cream? Cream from grass fed cows? I’ve also looked at the extract from the Laugerette (2011) article and it refers to ‘lipid source’ but doesn’t specify what sort of lipids (in what I can see in the extract). Could you explain if there is ANY differentiation between these lipid sources when referring to an inflammatory response from ingesting lipids, with or without good gut bacteria. Hi Tom. You may be right on the chemicals. However, the literature on the role of a HF diet and its modulation of gut flora and gut permeability is pretty extensive and well-accepted by the scientific community. No doubt there are lots of moving parts (as you point out), but the role of microbes in translocation of LPS etc into serum is a fact – and what the focus of the post was. Except that increasing bifido ameliorated the problem even with whatever fat they were using, indicating the type of fat is not the controlling factor. Not saying it doesn’t matter what type of fat you consume there are good ones and bad ones. What about fibre like psyllium husks? It’s a lot of eating to get massive amounts of fibre from veg. Do psyllium husks feed any type of gut bacteria? I love my gut bacteria but I’ve recently been avoiding garlic and onion after reading about FODMAP intolerance. I did notice some IBS like symptoms while frequently eating onions and brassica-type vegetables. Any suggestions for inulin/prebiotic foods that wouldn’t also be on the FODMAP list? My understanding is that foods to be avoided on a low FODMAP diet are basically the types of food that feed the gut bacteria. Should someone with FODMAP intolerance then avoid a “high” fat diet? i don’t really follow the FODMAP stuff much – so not really sure. Here’s the acceptable low FODMAP vegetable list; any standouts as food for positive gut bacteria? Love this site by the way and can’t wait to get my kit in the mail from the indiegogo project! Hi, I have IBS too but it never improved, and not even the FODMAP diet helped. My gut feeling is that one should keep increasing the pre/pro biotics consumption, and be patient for a few months…it can’t be right that cutting out what feeds our gut microbiome is good for you…fibre fibre fibre..eat more of it every day..just as Jeff Leach advises. FODMAPS are a complex issue. I have many of the same issues as you and have been able to improve, somewhat, my ability to digest some of them, although not all have been an issue for me. Most recommend probiotic supplements but I’ve found eating a variety of raw plant material has been most beneficial. Mind you, this needs to be either home grown or from a farmer’s market source you trust, and you just want to rinse the dirt of to retain the bacteria that naturally occurs on the plants. Google “hygiene hypothesis” if you aren’t already familiar. Being in close contact with dirt and animals is good as well. I too have major food intolerances, and quickly get severe acute reactions of various types when I eat any of the top foods that my quick Web scan shows contain higher inulin (onion, garlic, leeks, yams, jicama, asparagus, banana). Other inulin-containing foods high on the lists aren’t in grocery stores, as noted by other commenters. My further checking shows that it’s accepted by some that inulin feeds both good and bad bacteria (e.g., http://www.probiotics-help.com/inulin-fiber.html). Since testing has shown that my bacteria have been terribly skewed for years, that might explain my difficulties in even trying inulin-containing or other prebiotic sources, since my bad bacteria may be dominating my good. In addition, there is some evidence that about a third of the population has fructose malabsorption, so, by inference, may have have trouble with inulin/fructans (http://sacfs.asn.au/download/SueShepherd_sarticle.pdf). In any case, I think it’s reasonable to conclude that some people can’t improve their health simply by taking inulin in some form, natural or purified. I am really looking forward to getting my test results from American Gut to see if there is any insight on how I might improve my microbiome in some safe and effective way. Your post is similar to the point I wanted to raise. In the UK, our National Health Service is promoting, with a lot of success, the FODMAPS program for those with IBS and food intolerances. After trying different things for ten years, it is the one thing that works for me and it means eliminating inulin-containing foods amongst other fermentable saccharides. The acronym stands for Fermentable Oliga-saccahrides, Di-saccharides, Mono-saccharides and Polyols. It includes all the beans and pulses that give everyone ‘symptoms’ to some degree, lactose and fructose as possible triggers and many more in between. I have been disappointed to discover that the foods which may help rebalance my gut bacteria, such as the prebiotics give me the worse symptoms – I share your difficulties as I suspect a lot of people with IBS may do. Thanks for your thoughts and links and good luck. Did you have any more insights? I get my test soon hopefully. wow, so interesting!!! Is anyone researching gut composition and celiac? my take-home message: eat more kimchi! yum. Any comments on Acacia fiber from Gum Acacia? It’s marketed as a great source of prebiotic and as an effective treatment for IBS. don’t really follow that stuff. should be some info out there somewhere I would think. search PubMed for peer-reviewed research. As referenced above, regarding which fats evoke inflammatory body responses: Omega 6 and 9 fatty acids encourage arachidonic acid production and prostaglandin 3, both induce inflammation. Omega 3 seems to reroute the pathway to neutralize the inflammation. Soybeans and other legumes contain lectins which attach to the intimal layer of the small intestine and seem to encourage localized inflammation, which increases permeability above the site where the fermentation of the bifido reside and occurs. Possibly the most important article in all of the PaleoSphere. If we begin to redefine our consumption of inulin favoring foods to foster fermentation of the bifidobacterium, are there any other possible resident pathogenic microbes that will also be fed? In other words, is inulin fermentospecific to bifido? Sorry. I’m a bit confused. What is the difference between fructan and fructose? I’ve been avoiding onions because I thought they had fructose which is acidic. Have I been given the wrong information? no problem. fructan is a storage crabohydrate. and because of its special structure, it cannot be cleaved/broken down by human enzymes – so it passes onto the colon where it is fermented by the resident bacteria. due to its beta 2-1 structure (and a few others), bifidobacterium and other useful lactic acid bugs do well on it – so eat away on the onions! Also, what about the presence of inulin in chicory or dandelion root tea? This is a great way to get these herbs into the body for other reasons (liver, namely). However, I wonder if the actual material and fiber is necessary to benefit the beneficial bacteria??? What do you know about the potential prebiotic activity of homogalacturonan, found in Japanese kabocha squash (Cucurbita moschata Duch) as well as some other winter squashes. Jeff Leach – Are you still monitoring this article? i’d love to talk to you. Please email me. Pingback: Meat Leads to Inflammation? Pingback: THR1VE Blog | The Vegetarian Myth? fascinating post – but a question, what are those of us who are fodmap intolerant to do – i.e seemingly we cant handle pre biotic foods? to illustrate – just had bloods done and i do have high circulating levels of lps, but no antibodies against zonulin etc yet, so i have effectively dysbiosis but not full flare leaky gut, and at the same time stool samples show very low level of biffido bacteria. So, i really need pre biotic foods to sort the situation out but consumption of pre biotics results in bloating/gas/pain etc. What a quandary. leaving aside butyrate supplementation what can be done via diet. mounting research suggest circulating LPS levels are mediated by the flora – specifically, check out patrice cani’s work on pubmed. did you join american gut by chance? would be interesting to see who’s there. Hi Jeff – thanks for your reply, and thank you also re. Patrice Cani, just about to read his gut microbiata and pregnancy paper. I’m in the UK so can’t join American gut unfortunately. I heard your interview with Chris K and wish you the very best for the project. I got my own analysis done by metametrix, but if the American gut project ever comes across the pond them I’m In! I hope a uk or European project comes up soon, or even a chance to volunteer for research of this nature. What about probiotics integration like Kombucha, Kefir ? not sure it makes a lot of difference… but working on it as we speak. I need to have a read through these studies – but does type of fat make a difference? i mean in someone with low biffo/sibo/high levels of endo toxins – because thats me right now. My only fat source right now is coconut oil but if it’s that which is pushing endo toxins in to the blood right now then i’m off that until dysbiosis is sorted. AARON…SIBO is caused by a low metabolic rate. Boost your thyroid/metabloism and eat a raw carrot or two daily and it will go away. It really worries me when I hear all the health guru’s talking about healthy fats. People are running around eating avocado and drizzling oil on their food now, but I don’t follow any of them. Eating lots of fat makes me store fat. I’ve also known that eating tons of fibre makes me lose fat. When I say tons, I mean about 60+ grams per day. Of course, no one can eat that often and that much food. So I use the highest fibre foods I can find, like beans and lentils and supplement with psyllium to reach or exceed the 60 grams. This leaky gut thing may be the missing piece of the puzzle. The periods when I’ve eaten lots of fat, I’ve not eaten lots of fibre along with it. When I’ve been eating lots of fibre, it’s in conjunction with a low-fat diet. Fat is high in calories and is a concentrated source of energy. I imagine that some oils we consume are rancid, and they get rancid faster when we extract them. I understand that consuming rancid lipids cause inflammation in cells and lead to disease. Avocado has LOADS of fat, and who can eat just one thin slice? How much fat does a human need in a day, really? Certainly not a whole avocado’s worth – surely? I feel in 20 years, the gurus will be lamenting the obesity crisis. They’ll be saying they told people to eat too much “healthy” fat, and they got fat…..just the same way they’re saying they told folks to eat too many carbs and low fat in the past. Crossed my mind. Some of the FODMAP people may really have a bigger problem with toxins such as glyphosate. Yep, it’s very complex this human diet thing. But you have your own answer-high fat low fiber or high fiber low fat. Try high fiber high or moderate fat. Total calories do make difference and there are many variables in fats. Ever since Ancel Keys it’s been “eat vegetable oil! !” An oil that readily turn to trans fat and oxidizes at very low temperatures. Junk food. Avocados add phytonutrients, antioxidants, fiber and good fats to the diet. Enjoy them. Brilliant! Just the info I’ve been looking for. It really helps to fill in the gaps.